ROCHESTER, NY (WXXI) – What some may have once written off as a pipe dream is about to get real for a small western New York city. Wednesday, August 1 is the grand opening of the National Comedy Center in Jamestown. The $50 million high tech venue has been years in the making. It was inspired by hometown hero and comedy legend Lucille Ball. Visitors will be invited to take a “sense of humor profile”. 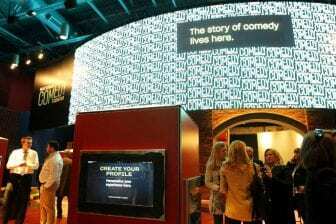 Their comedy preferences will be recorded in a microchip bracelet and that will trigger a personalized experience as they walk through the exhibits. One wing of the center is dedicated to the archives of George Carlin including his handwritten notes and scripts. Comedians Amy Schumer, Lily Tomlin, and Dan Akroyd are just a few of the stars kicking off the five day opening celebration. Gunderson said it was critical to get their support. The August 4 Lily Tomlin performance and the August 2 Saturday Night Live originators event are sold out, but tickets are available for other events. On Thursday, August 2, the Willow Bay Theater will host a Lucille “ball” featuring 1950s music and a contest for the best “I Love Lucy” themed costumes. A feasibility firm estimates the Comedy Center will draw 114,000 visitors a year.